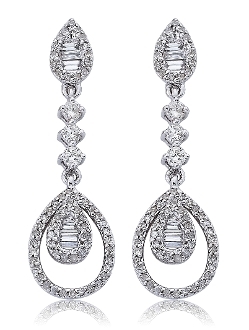 These captivating teardrop earrings unite 0.78 Carat t.w. Brilliant round cut Diamonds with baguettes in a contemporary yet classic way. Baguettes bordered in brilliant pave Diamonds flow effortlessly as 3 prong set solitaires sway with your every move. Dangling pave Diamond-encrusted baguette teardrops wrapped in a brilliant Diamond border and crafted in 14 Karat white gold are ideal for an evening out. They are post style and secure with push backs.